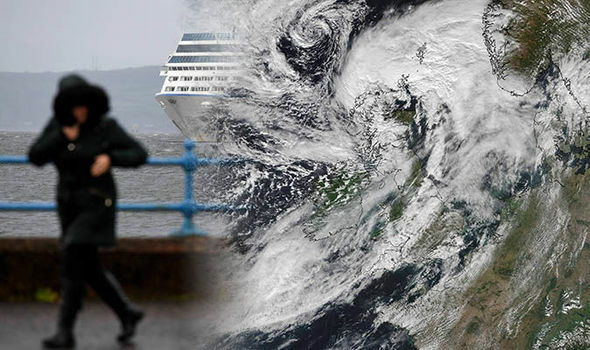 Home World Headlines Storm Ali latest: What is the Met Office weather forecast for tomorrow? Storm Ali latest: What is the Met Office weather forecast for tomorrow? STORM Ali has wreaked destruction across the UK with winds reaching over 100mph in some places. What is the Met Office weather forecast for tomorrow? Trees have been uprooted, lorries overturned and planes grounded due to Storm Ali’s path of terror across the UK. Two people have died due to severe winds, with a woman’s caravan blown from a cliff whilst she was inside and a man being hit by a fallen tree. More have been treated for injuries caused by flying debris and uprooted trees, prompting Dumphries and Galloway to declare a “major incident”. As the storm makes its way across the UK, winds have been most severe in Scotland and Northern Ireland. The Met Office’s amber wind alert has since expired although a yellow wind alert remains in place until 10pm tonight. What is the Met Office weather forecast for tomorrow? The Met Office predicts that the strongest winds will die down tonight, however, it will remain very windy in the North of England and Scotland with blustery showers. After midnight heavy rain is due to reach Wales and central and northern England. During the day tomorrow, the north of England will see conditions calm down, however, northern Scotland will experience heavy showers and blustery winds. The rest of the UK will feel unsettled as another low arriving from the southwest brings spells of heavy rain and strong winds. The Met Office has issued weather warnings for tomorrow, one being a yellow alert for rain lasting between 4am and 10pm. This yellow alert is for North East England, North West England, Wales, Yorkshire & Humber. According to the latest Met Office forecast the rain will move northeast across the UK tomorrow and will be persistent and at its heaviest over Wales and northwest England. The weather service predicts that 40-60 mm of rain is likely widely across the warning area, and some higher ground in Wales and perhaps Cumbria could see 80-100 mm. There will also be strong winds and coastal gales across southern parts of the warning area. There is also a yellow warning for wind tomorrow, beginning at 6pm and lasting until 9am on Friday, September 21. The areas affected by this wind warning are the East Midlands, East of England, London & South East England, North West England, South West England, Wales, West Midlands and Yorkshire & Humber. Strong winds will develop over Wales and southwest England on Thursday evening and will spread eastward across England. Gusts of around 50mph are expected, with a small chance of winds of up to 65mph will hit overnight into Friday. Heavy rain will accompany the strong winds, with “short-lived outbreaks” says the Met Office. On Friday the strong winds will clear into the North Sea.